Announcement Welcome! There is an 8 week wait time for new orders (with some exceptions). If you are unsure if you will receive your order in time please message me before ordering. Thank you so much for your patience! Welcome! There is an 8 week wait time for new orders (with some exceptions). If you are unsure if you will receive your order in time please message me before ordering. Thank you so much for your patience! They were beautiful. Communication was great and delivered quickly for a custom order. I’ll post a picture once on my walls. 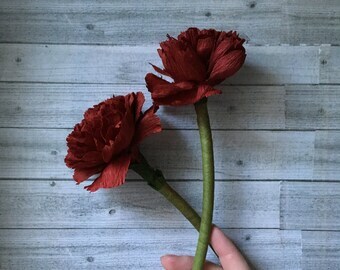 You made 1 large, 1medium, and 3 small flowers using personalized paper I sent you. The flowers are for my daughter’s “new” bedroom. Thank you so much for helping me create a very personalized room for my daughter. Don't be afraid to be bold!! 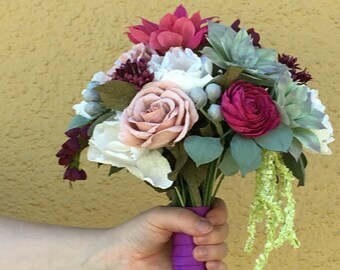 Customize your bouquet and make it yours!! Working on a slightly altered wildflower bouquet! Adding in some eucalyptus in place of a few red lupine. Working on a bridal bouquet! Succulents and Harry Potter book pages. My best friends wedding! Hey look, I'm one of the bridesmaids! Peonies, ranunculus and rose buds in a mix of bright corals with small bids of navy hydrangea. A mix of cornflower blue, creams and white against the dark emerald green dresses are just to die for. Vintage maps made into ranunculus, peonies and pastel pink roses. For a personal touch we added a little airplane. This was my very first large custom order! That was a whole 6 years ago already! Did someone say Paper flowers?! If you are looking for an alternative to the real thing, whether it be due to allergies, climbing costs, forever keepsakes or just because you want something super fun, then paper flowers might be right up your alley. I fell in love with the craft after spending several months creating paper products for my own wedding back in 2011. After I married my best friend (and partner in crime) I couldn't resist making more paper art and stumbled upon paper flowers. I made my first kusudama origami bouquet and listed it here with high hopes! Little did I know that I would be here today, 1000's of flowers later. I take serious pride in creating unique and special flowers for each one of my brides to reflect their personality and ultimate goal at achieving their dream wedding. So what are you waiting for?! Let's get started on your very own forever flowers today! What I love most about working with my brides is that I have the pleasure of creating something that they will cherish for a long time to come. While working out all the details of their big day, we get to know each other. I absolutely love that we can connect and create friendships over such a special event in their lives. It makes me so happy that even after their wedding day has come and gone that we still stay in touch and I get to watch their little families grow. Born and raised in the Olympic Mountains, near Sequim, Wa, where I learned to appreciate every aspect of what nature has to offer. When I'm not in the studio creating new flower designs or putting together wedding packages for my brides I am most easily found trudging through the forest with my husband and son looking to explore new trails, fishing the rivers, kayaking in the straits and foraging for mushrooms (mostly as photographic muses). Getting outdoors is my best recharge. I find it's the best way to bring inspiration into my work while enjoying my little family on our adventures. Growing up in the Pacific Northwest, surrounded by mountains, ocean, and rain forest, has spoiled me royally. I feel quite a connection to nature and love incorporating natural elements into my work. The best part is creating something new everyday! This guy right here is the reason I strive to run this small business. He is the best assistant I could ask for. His roles include modeling for me, helping me measure and weigh packages and is always helping me with trips to the post office. Hello and welcome to My Woolly Mammoth! A place where you will receive beautiful handmade paper flowers to suite your personal needs. I strive to offer clean, neat and attractive flowers for any occasion in any style desired. Returns or exchanges will not be permitted, however, if items are lost or damaged during shipping we will work together until the issues are resolved. Etsy's Direct check out (Secure Credit and Debit card purchase) and Paypal accepted. Work will start on items as soon as payment has cleared. *For faster shipping, please message me for added rates. **Please note some countries require the buyer to pay customs fees when purchasing items from out of country. Please be sure you are familiar with your countries policies! I am not responsible for additional costs. Special orders are always welcome! If for some reason I cannot meet the requirements of your request, I will inform you and let you know what options I have available. All items in this shop have been handmade by myself and are made fresh to ensure they are just what you were looking for. Please be sure to message me with any questions or concerns at all. I appreciate your input.